Over the years, we have all come to love and depend on dropbox for its seamless and no-nonsense sync and backup feature. Even now after all these years when there are so many cloud services out there with bigger storages backed by big companies, I would still recommend dropbox as a first choice. Having said that, there are some of us who likes to have more control over our data and services, and there is a very easy and free option out there. It’s called owncloud, and it takes less than 5 minutes to install. The only pre-requisite is that you get your Linux-based server. It could be in the form of low-end box or a dedicated server or cloud service like AWS or more user-friendly like DigitalOcean that lets you increase your HD space on the go. While there are packages and installation instructions for almost all mainstream Linux distro out there, I am going to show you how to do it with Ubuntu server in less than 5 minutes. Simple install owncloud with apt-get apt-get install owncloud. You will be prompted to make a MySQL password. 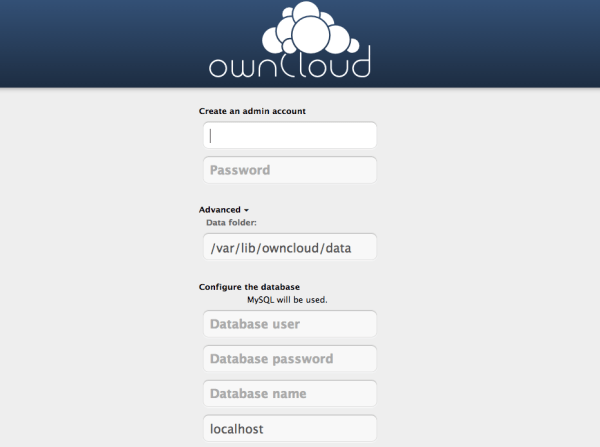 Go to your-ip-address/owncloud to configure your owncloud server. You will be asked to create an account and put mysql credentials (just like WordPress). Intall desktop client for your OS, Windows/Mac/Linux or mobile client for iOS/Android. You can also upload from the web interface. That’s it, in less than 5 minutes you have your own dropbox-like file sync and storage service, make sure to check out the setting section to customize owncloud to your needs or add new users.